O'Neill remains with the Tok'ra following his implantation with a symbiote to cure an alien virus. Carter receives a suspicious late night phone call from a Dr. Flemming, who warns of Adrian Conrad's experiments with Goa'uld symbiotes before he is apparently killed, and Carter, Teal'c, and Jonas are sent to the tiny seaside town of Steveston, Oregon to investigate. There they find the sheriff, who suspects that Flemming has been murdered. A search of Flemming's home turns up no clues until a package, which he had apparently mailed to himself, arrives. Inside, SG-1 finds a large syringe filled with an unknown serum. Jonas notices that the townspeople seem to be unusually withdrawn, and clues suggest recent activity at the abandoned shipyard. SG-1 investigates and finds computer disks, blueprints, and the partially completed construction of an alien spacecraft. 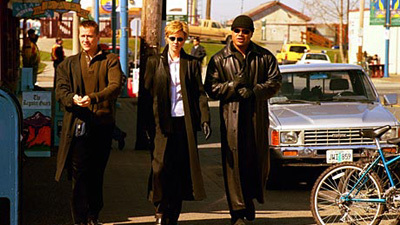 That night, as Carter analyses the serum and computer disks, Teal'c and Jonas observe the townspeople, apparently sleepwalking, arriving at the shipyard to continue construction of the alien craft. Teal'c and Jonas are captured by an undercover NID agent who reveals that immature cloned symbiotes, strong enough to exert their control only at night, have entered the townspeople. The NID has been monitoring the situation. Carter is captured by the townspeople who implant her with a symbiote clone, and the Goa'uld reveal their plan to infiltrate both the NID and SGC. However, Carter had gambled that Flemming's syringe contained an antidote, and had injected herself with it before her capture so that the clone within her could not survive. As NID forces sweep into town, Carter works undercover to apprehend the compromised NID agents and to bring an end to their operation. The cloned Goa'ulds are susceptible to a particular antibiotic, and as the townspeople are injected with the drug, the sleepy little town returns to normal. It has been ten months since Adrian Conrad was implanted with a symbiote. Immunitech Research is a wholly-owned subsidiary of Zetatron Industries, owned by Adrian Conrad. Immunitech relocated operations from Phoenix to Steveston, Oregon. Immunitech had cloned the symbiote to create a superdrug, until an accident infected the townspeople. Dr. Richard Flemming was a biologist, and formerly a professor of advanced genetics at Stanford, famous for developing hybrid strains of disease-resistant corn and cotton. He and his partner at Immunitech, Peter Stofer, had cloned Adrian Conrad’s symbiote. The clones had no naquadah in their blood, making their presence indetectable, and they were too immature to assert permanent control of the host. The NID had been monitoring the situation in Steveston for three months. Immunitech engineered the symbiotes with a built-in kill switch, a susceptibility to a particular sulfa-based antibiotic which was used successfully on the townspeople under the guise of an innoculation against meningitis. The ship being built by the nightwalkers was transferred to Area 51. The Immunitech security guard was named Gerard A. Tobin. NID Agent Cross worked undercover as sherriff’s deputy P. Mullie.